Billionaire kidnap kingpin, Chukwudumeme Onwuamadike aka Evans, has again dragged the Inspector General of Police, and three others before a Federal High Court in Lagos over his alleged illegal detention. In the new suit filed on Thursday, Evans is claiming N300m as general and exemplary damages against the police for alleged illegal detention and unconstitutional media trial. Joined as respondents in his new originating motion are the Nigeria Police Force, the Commissioner of Police Lagos State and the Special Anti-Robbery Squad, Lagos State Police Command. Evans had on June 28 filed an ex parte application with reference number FHC/L/CS/1012/2017, before the same court, seeking an order directing the respondents to charge him to court. He had also in the alternative sought an order directing the respondents to release him unconditionally where no charge is preferred against him. In an affidavit deposed to by his father, Mr Stephen Onwuamadike, it was averred that the applicant has been subjected to media trial without any court order by the respondents. Onwuamadike further averred that the media trial and news orchestrated by the respondents have continued to generate reactions in both print and electronic media without his son being afforded fair hearing before a court of law. 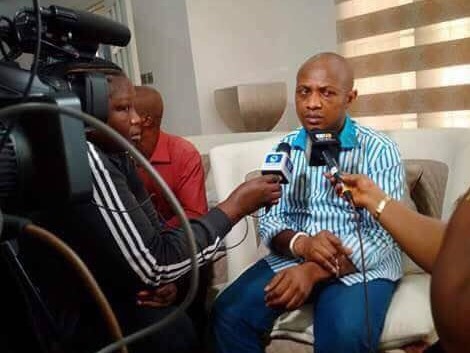 Evans contended that his continued detention by the respondents since June 10, without a charge, or release on bail, is an infringement on his fundamental rights. In his new suit also marked FHC/L/CS/1012/ 2017 and with the same persons as respondents, the applicant is seeking a declaration that his continued detention since June 10 without arraignment, violates his fundamental rights as guaranteed under the 1999 Constitution. He is also seeking a declaration that his parade on June 11 before journalists in Lagos, at the Lagos Police Command Headquarters in Ikeja, without any court order, is unconstitutional and illegal. He is consequently, seeking an order, compelling the respondents to immediately arraign him before a law court, or release him from custody forthwith. ‘Evans’’ is also seeking an order, compelling the respondents to jointly and severally, pay him the sum of N300m as exemplary damages for illegal detention and alleged harm caused by the alleged media trial. The suspect is also seeking an order of perpetual injunction, restraining the respondents from further arresting, detaining, harassing, investigating or inviting him in relation to the facts of his case. He is also seeking further orders as the court may deem fit, to make in the circumstances. No date has been fixed for hearing yet.